The Global Volcanism Program has no activity reports for Cofre de Perote. The Global Volcanism Program has no Weekly Reports available for Cofre de Perote. The Global Volcanism Program has no Bulletin Reports available for Cofre de Perote. Cofre de Perote is a massive Quaternary andesitic-dacitic shield volcano that anchors the NNE end of a volcanic chain extending southward to Pico de Orizaba (Citlaltépetl) volcano. Lava flows dominated in formation of the broad compound shield volcano, which is largely of Pleistocene age and is morphologically distinct from the steep-sided stratovolcanoes of the Mexican Volcanic Belt. Glaciation at the summit has left a steep-sided, box-like peak, which is sometimes referred to as the "Treasure Chest of Perote." A large compound escarpment formed in part by multiple edifice collapses cuts the eastern side of the volcano. 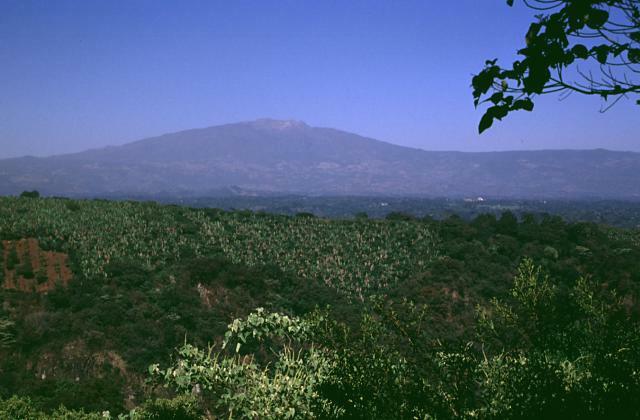 Numerous monogenetic cinder cones, likely related to regional volcanism, were erupted through the flanks of Cofre de Perote volcano. A cluster of very youthful basaltic cinder cones is located on the NE flank, and young lava flows have traveled eastward to beyond the major city of Xalapa (Jalapa), the capital of the state of Veracruz. The youngest lava flow, from the compound El Volcancillo vent on the lower NE flank, was radiocarbon dated at about 900 years ago. Carrasco-Nunez G, Righter K, Chesley J, Siebert L, Aranda-Gomez J-J, 2005. Contemporaneous eruption of calc-alkaline and alkaline lavas in a continental arc (eastern Mexican volcanic belt); chemically heterogeneous but isotopically homogeneous source. Contr Mineral Petr, 150: 423-440. Carrasco-Nunez G, Siebert L, Diaz-Castellon R, Vazquez-Selem L, Capra L, 2010. Evolution and hazards of a long-quiescent compound shield-like volcano: Cofre de Perote, Eastern Trans-Mexican Volcanic Belt. J. Volcanol. Geotherm. Res., 197: 209-224. Rodriguez S R, Morales-Barrera W, Layer P, Gonzalez-Mercado E, 2010. 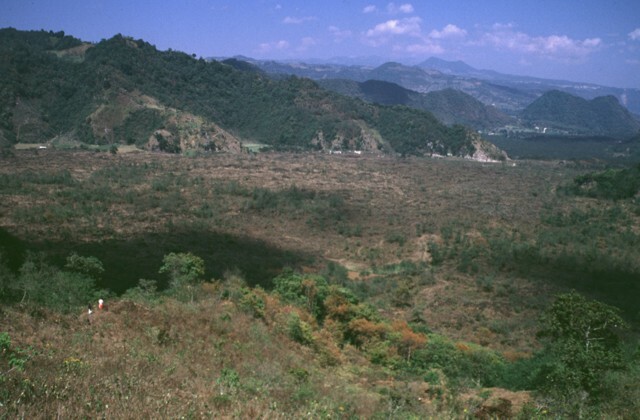 A quaternary monogenetic volcanic field in the Xalapa region, eastern Trans-Mexican volcanic belt: geology, distribution and morphology of the volcanic vents. J. Volcanol. Geotherm. Res., 197: 149-166. Siebert L, Carrasco-Nunez G, 2002. Late-Pleistocene to precolumbian behind-the-arc mafic volcanism in the eastern Mexican Volcanic Belt; implications for future hazards. J. Volcanol. Geotherm. Res., 115: 179-205. There is no Deformation History data available for Cofre de Perote. There is no Emissions History data available for Cofre de Perote. The broad Cofre de Perote massif towers above the eastern margin of the Serdán-Oriental basin. The low-angle andesitic-dacitic shield volcano consists primarily of thick lava flows. Cofre de Perote is the northernmost of a roughly N-S-trending volcanic chain at the eastern margin of the Mexican Volcanic Belt that extends southward to Orizaba volcano. 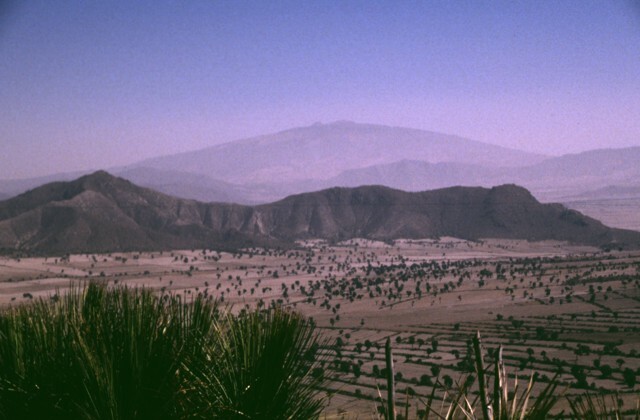 The ridge in the center of the photo is an outcrop of Cretaceous limestone that underlies the Cofre-Orizaba volcanic chain and is exposed on either side of the range. Cofre de Perote, a massive Quaternary andesitic-dacitic shield volcano that anchors the NNE end of a volcanic chain extending southward to Pico de Orizaba volcano, rises above banana plantations below its SE flank. A large compound escarpment formed in part by edifice collapse cuts the eastern side of the volcano. The upper part of this scarp forms the barren area below the summit. Numerous cinder cones, some of Holocene age, dot the flanks of the largely Pleistocene volcano. The eastern side of the summit of Cofre de Perote volcano is truncated by a steep escarpment. The volcano lies at the NNE end of a N-S-trending range that extends 50 km south to glacier-capped, historically active Pico de Orizaba (Citlaltépetl) volcano in the distance. Like other N-S volcanic chains in México trending perpendicular to the Mexican Volcanic Belt, volcanism in the Cofre-Orizaba chain has migrated to the south. Radio communication towers top the southern peak of Cofre's compound summit. 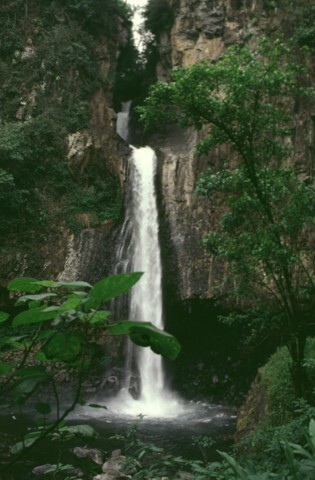 A series of waterfalls that form a popular tourist attraction near the town of Xico on the eastern flank of Cofre de Perote pours over a massive lava flow from the volcano. 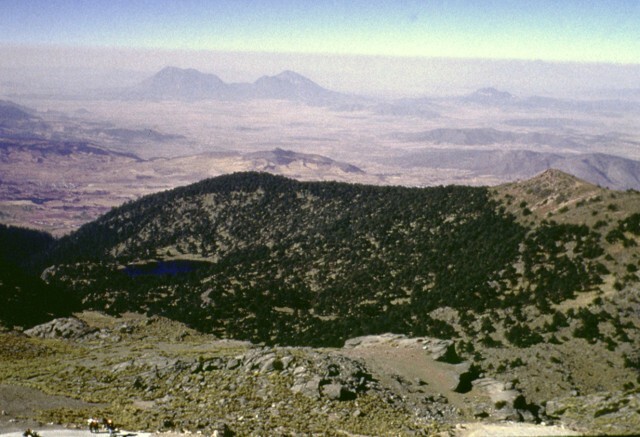 Cofre de Perote was constructed along the margin of the Mexican Altiplano, and thick viscous Pleistocene lava flows extend tens of kilometers down the eastern flanks of the volcano towards the coastal plain. 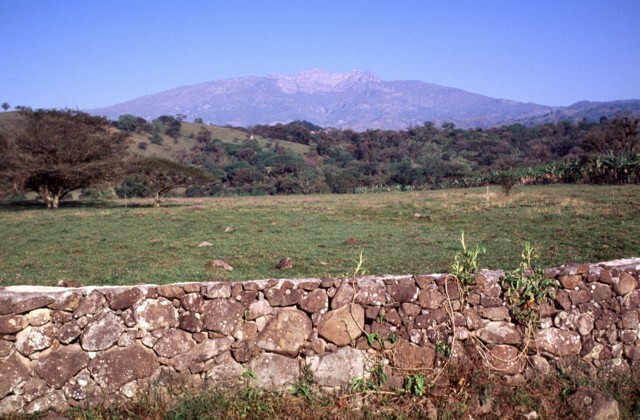 Large compound horseshoe-shaped scarps, formed in part by edifice collapse, truncate the eastern side of Cofre de Perote volcano, forming a steep barren wall below the summit. 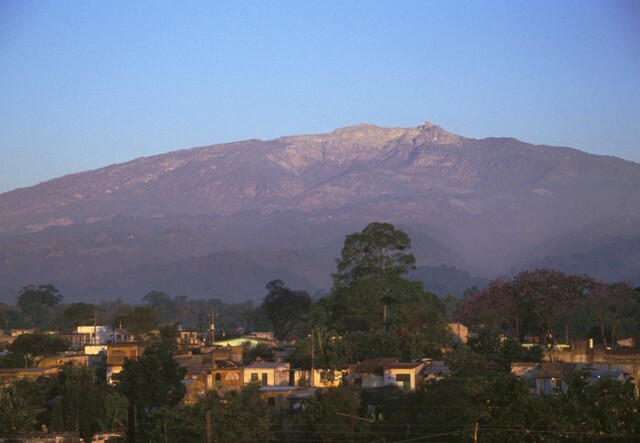 The massive size of the low-angle andesitic-dacitic shield volcano can be appreciated in this photo taken from the historic town of Coatepec, which lies 21 km ESE and 3000 m below the summit. 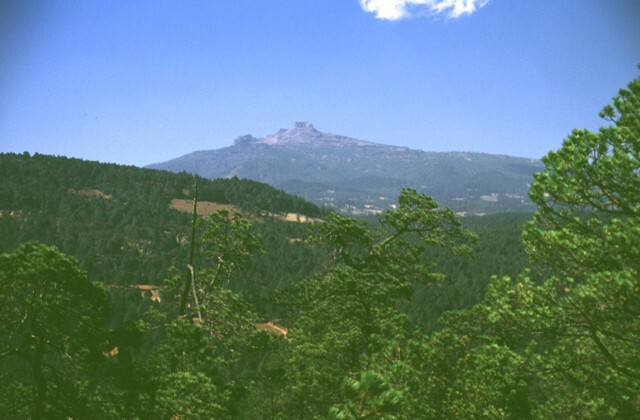 The volcano is the centerpiece of Cofre de Perote National Park. Cofre de Perote volcano towers above the historic city of Coatepec on its eastern flank. 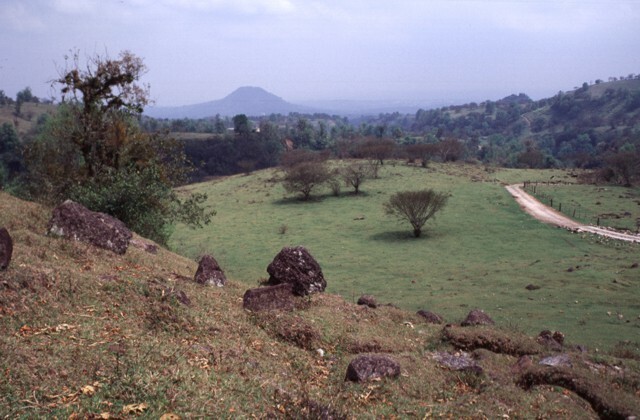 The flanks of the low-angle andesitic-dacitic shield volcano are dotted with pyroclastic cones, including the one in the center of the city of Coatepec from which the photo was taken. The volcano was constructed at the eastern margin of the Alitplano and consequently has an asymmetrical profile, extending farther towards the east in the direction of the lower-altitude coastal plain. 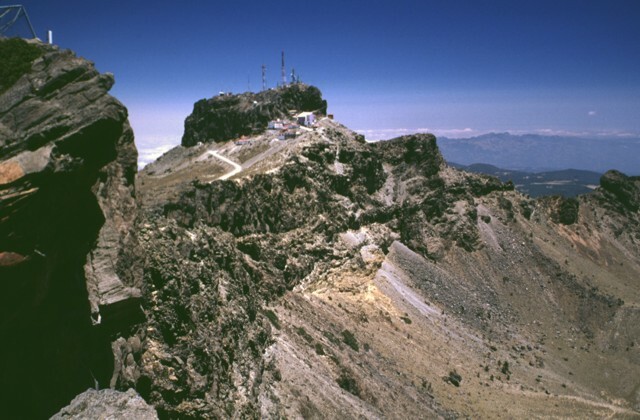 The box-like summit of Cofre de Perote volcano bristles with radio communication towers. The summit region of the volcano consists of at least two glacially eroded edifices. Glacial cirques and moraines are found in the summit area of Cofre. The steep-walled east-facing scarp cutting across the center of the photo that truncates westward-dipping lavas was formed in part by edifice collapse. 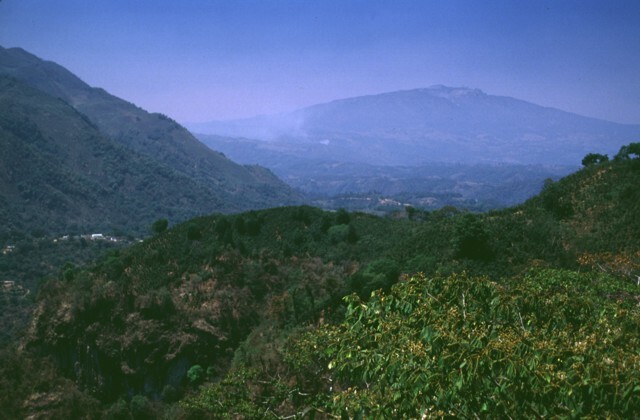 The broad massif of Cofre de Perote volcano at the upper right anchors the northern end of a N-S-trending volcanic chain at the far eastern end of the Mexican Volcanic Belt. 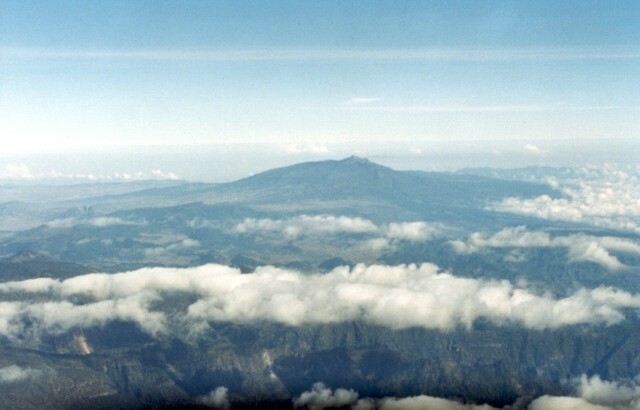 Despite its low appearance, the 4282-m-high volcano, seen here from the SE, rises 3000 m above its eastern base. Its broad profile was produced by the extrusion of thick sequences of andesitic-dacitic lava flows. The steep-walled, 200-m-wide pit crater in the foreground at El Volcancillo on the NE flank of Cofre de Perote was the source of the voluminous Río Naolinco lava flow about 900 years ago. The compound tube-fed basaltic pahoehoe lava flow traveled initially to the north and then to the east for a distance of 50 km. El Volcancillo consists of two overlapping craters constructed on a ridge crest. The Río Naolinco lava flow originated from the NW crater; the SE crater fed the Toxtlacuaya aa lava flow down a valley on the opposite side of the ridge. 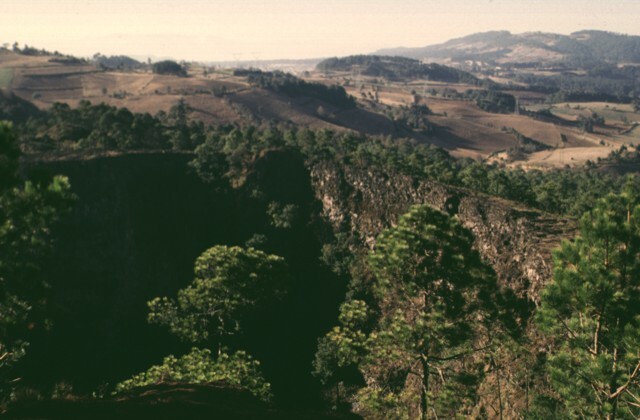 The people in the left foreground are standing on the Toxtlacuaya lava flow, which cascaded in a narrow lobe down into the valley filled by the flat-lying Río Naolinco lava flow. Both flows were produced about 900 years ago during a geochemically bimodal eruption which initially produced the alkaline Toxtlacuaya lava flow and then the voluminous calc-alkaline Río Naolinco flow. Although the flows were erupted through the lower flanks of Cofre de Perote volcano, they are geochemically distinct from Cofre de Perote lavas. The barren, sparsely vegetated area in the foreground is part of the voluminous Río Naolinco lava flow, which extends about 50 km from the El Volcancillo vent complex on the NE flank of Cofre de Perote. The tube-fed pahoehoe lava flow traveled from 2700 m on the NE flank of Cofre de Perote down to 360 m elevation near the town of Chicuasén at the edge of the Atlantic coastal plain. The 900-year-old lava flow is the youngest of a series of youthful flows erupted on the NE flank of the volcano. The name of Cofre de Perote (meaning trunk or storage chest of Perote) was derived from the unusual box-like summit of the volcano. The volcano, sometimes referred to as the Treasure Chest of Perote, is seen here from the NW above fields near the town of Perote. The lower northern flanks of the largely Pleistocene volcano are overlain by ignimbrite deposits erupted from Los Húmeros caldera. 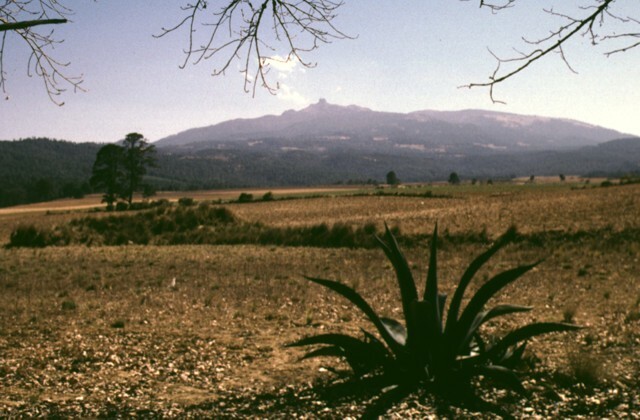 One of the Aztec names for Cofre de Perote was Naucampatepetl, or "Mountain of Four Sides." 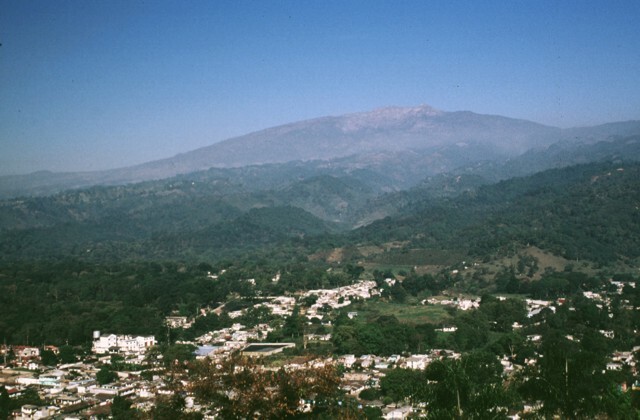 The flat-topped glacially modified summit of Cofre de Perote volcano is seen here from the NE on the road between the cities of Perote and Jalapa (Xalapa), the capital city of the state of Veracruz. The highway follows the low-angle surface of valley floors filled by young lava flows erupted from vents on the NE flank of the volcano. The smooth profile of the Cofre de Perote volcano is modified on the NE side by steep compound escarpments. A box-like, glacially eroded pinnacle forms the summit. The configuration of the summit of the volcano reflects both edifice collapse and glacial erosion. Truncated dacitic lava flows can be seen on the right-hand horizon. Photo by Hugo Delgado, 1997 (Universidad Nacional Autónoma de México). The broad Cofre de Perote massif in the distance is seen in an aerial view from the west. 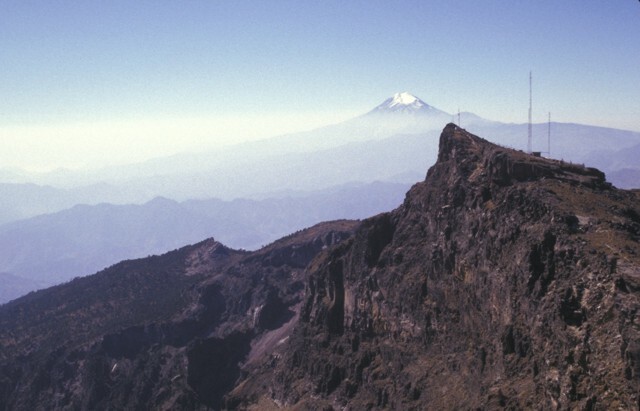 As with other volcanoes of the Orizaba-Cofre chain, Cofre de Perote was constructed over the eastern margin of the Mexican altiplano, so that the volcano asymmetrically extends farther toward the lower-elevation coastal plain. The low-angle compound shield volcano rises 1700 m above the Serdán-Oriental basin on the west and 3000 m above the city of Jalapa (Xalapa) on the east. Photo by Lucio Cardenas, 1996 (CENAPRED, courtesy of Hugo Delgado, Universidad Nacional Autónoma de México). 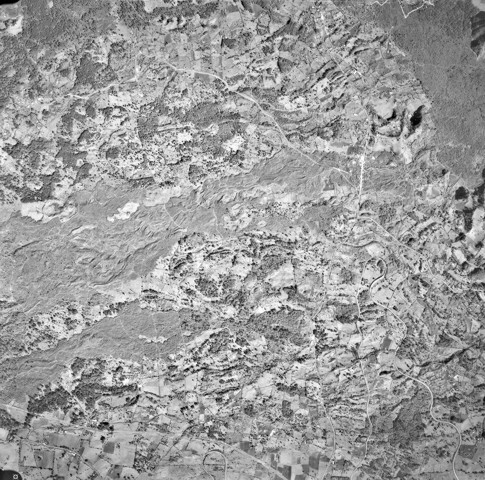 Quaternary lava flows of varying ages cover the entire 4-km-wide field of view in this aerial photo of an area NW of Jalapa. Several lobes of the sparsely vegetated Toxtlacuaya lava flow extend across the center of the photo. The northernmost lobe joins with the darker-colored Río Naolinco lava flow at the upper right. Both of these flows were erupted about 900 years ago from El Volcancillo, a vent on the NE flank of Cofre de Perote. The Toxtlacuaya flow overlies older flows from the Central Cone Complex and still older flows at the bottom from Cerro La Joya. The Río Naolinco lava flow, which fills the entire valley floor in the foreground, is the most voluminous of two chemically distinct lava flows erupted from El Volcancillo on the south flank of Cofre de Perote volcano about 900 years ago. The Río Naolinco flow, of hawaiite composition, traveled 50 km and has an estimated volume of about 1.3 cu km. This view looks south across the flow near its widest point about 25 km from the vent. Boulders litter the irregular surface of the Xico debris-avalanche deposit, which formed at the end of the Pleistocene during the youngest of several edifice collapse-collapse events at Cofre de Perote volcano. The highly mobile avalanche traveled many tens of kilometers into the Río Pescado drainage. 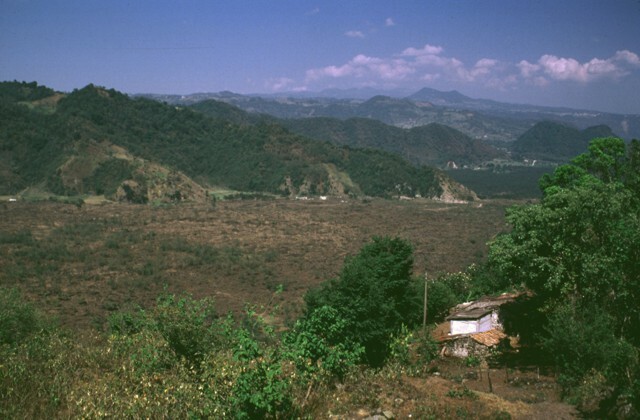 The avalanche deposit was named for the town of Xico, which lies in front of Cerro San Marcos, the flat-topped cone on the left-center horizon. 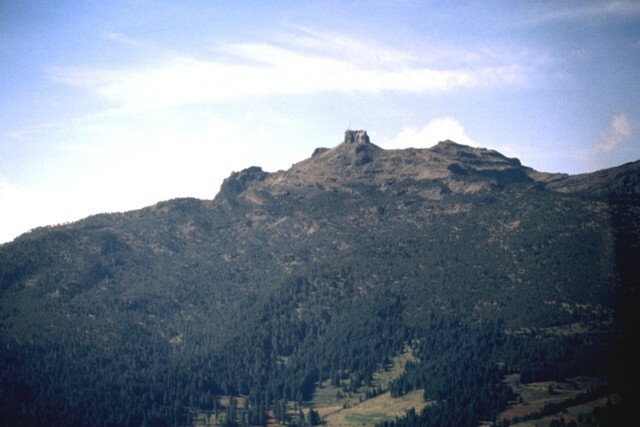 The eastern side of Cofre de Perote volcano was truncated by a series of edifice collapse events during the late Pleistocene. The youngest escarpment forms the unvegetated area below the summit in this view from just south of the town of Xico, which overlies the youngest avalanche deposit. Boulders of this avalanche litter the field and provided a source of materials for the stone wall in the foreground. The summit of Cofre lies 17 km to the west and 3000 m above this location. The unassuming hill on the right-center horizon is El Volcanicillo, a compound cinder cone that fed two lava flows down opposite sides of a ridge on the NE flank of Cofre de Perote volcano. 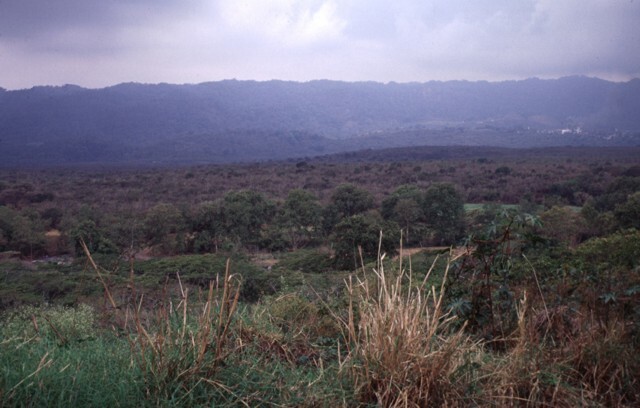 The forested area extending across the photo below the cone is the Río Naolinco lava flow, a massive 900-year-old pahoehoe flow that reached as far as 50 km from El Volcanillo; the aa Toxtlacuaya flow traveled down the opposite side of the ridge. 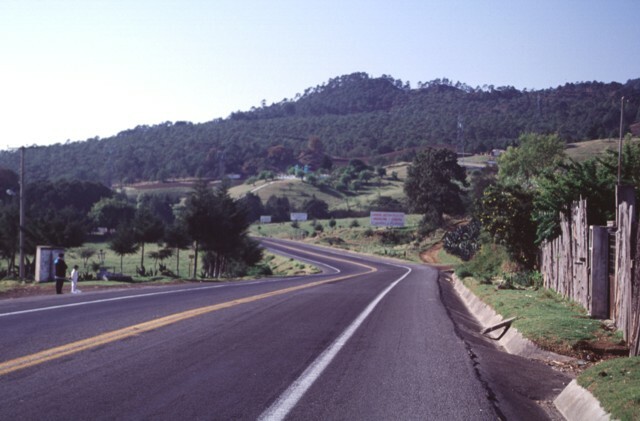 Highway 140 in the foreground, a major transportation corridor between Jalapa and Puebla, cuts across the flow. Glacial erosion has affected the summit of Cofre de Perote volcano. Summit lava flows show glacial striations, and a glacial tarn (left) is found SW of the summit. Cofre de Perote overlooks the intermontaine Serdán-Oriental basin, dotted with rhyolitic lava domes, tuff rings, lava flows, and scoria cones. The twin rhyolitic Las Derrumbadas lava domes (distant left center) and Cerro Pinto dome to their right lie about 40 km SW of Cofre de Perote. 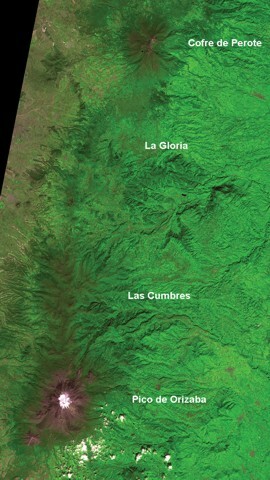 The flanks of the massive Cofre de Perote shield volcano extend across most of the left two-thirds of this satellite image. The summit of the volcano (lower left) has been truncated by edifice failure to the east. The large brown area at the middle right is Jalapa, the capital city of the state of Veracruz; to its SW is the city of Coatepeque. 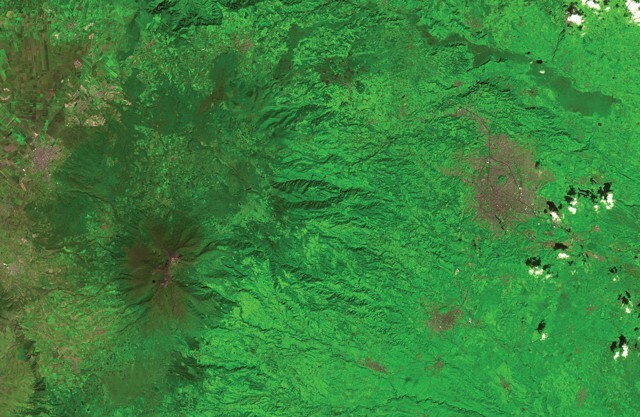 The voluminous dark-colored Río Naolinco lava flow north of Jalapa originated from a vent on the lower NE flank of Cofre de Perote about 900 years ago and traveled an additional 15 km beyond the margin of this image. There are no samples for Cofre de Perote in the Smithsonian's NMNH Department of Mineral Sciences Rock and Ore collection. Large Eruptions of Cofre de Perote Information about large Quaternary eruptions (VEI >= 4) is cataloged in the Large Magnitude Explosive Volcanic Eruptions (LaMEVE) database of the Volcano Global Risk Identification and Analysis Project (VOGRIPA).